Ras Resorts, on the bank of river Daman ganga, with lush green lawns bordered with trees & fresh countryside air, is just two and a half hour drive away from Mumbai and two hour drive from Surat. Monsoon: Mid - June to Mid September. The resort offers 100 rooms including Standard, Deluxe and Executive style rooms. All guestrooms have scenic views, facing either the garden or the river. For your entertainment and dining pleasure, there are a range of restaurants to choose from, serving a wide range of tasty cuisine, and the bar is well stocked with a choice selection of liquors. Children's Playground - large playground equipped with swings, see-saw and so on. We also have Adult and Baby Pools, and health club / wellness centre facilities available exclusively to hotel guests in a highly comfortable setting with steam room & sauna. We often organise Housie, Magic shows, Live Bands and Discos. The three conference halls equipped with modern facilities that accommodate 20 to 200 people are ideal for holding social functions, parties and celebrations, cultural events, business conferences, product launches and corporate functions. 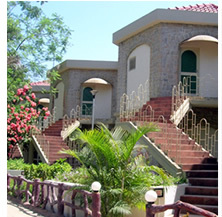 Sandal Cola Lawns is an ideal party venue for get togethers and banquets for upto 500 people. Ras Resorts is also affiliated to Resorts Condominium International U.S.A. (RCI), thereby giving you an option to enjoy worldwide holidays.